Christopher “Kit” Ellingsworth is a rakishly handsome war vet, and his exploits during battle have earned him the title of Earl when he returns home to London. Unfortunately, the title doesn’t come with the riches he desires. A blessing comes in the form of a will from his mentor that contains a sizable inheritance. The only stipulation: he must marry within a month. All of a sudden, the women Kit used to seduce and pleasure are put on the back burner as he looks for someone suitable of wearing his last name. Enter Tamsyn Pearce. After her parents died and her neglectful aunt and uncle take over the estate, Tamsyn knows it is up to her to keep the townspeople and the town itself afloat by illegally selling the finest lace and brandy. When she fails to find a buyer while in London, she resigns herself to the idea of marrying a wealthy, and hopefully inattentive, socialite so she can buy her childhood home from her uncle. When Kit presents her with a proposal, both believe that they are the answer to each other’s prayers. Until a stipulation in the will names Kit’s wife as the controller of the inheritance. 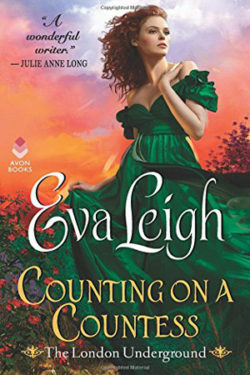 COUNTING ON A COUNTESS starts out as a typical and somewhat overused story line, but quickly morphed into something unique and at times humorous. The lighthearted banter between the two main characters is endearing and highlights the connection they feel for a kindred spirit. The story flows well and it is especially motivating to see how each character grows and morphs from their first introduction to readers to the last page.